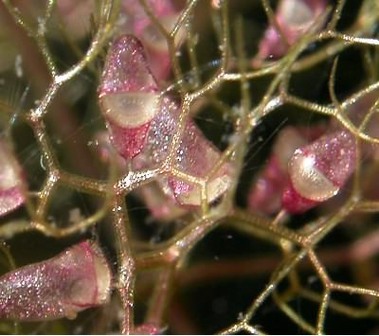 Recent advances in scientific photography allow us to see cellular botany as never before. This incredible photograph was taken by "blepharopsis" in 2014. Click on the URL below to see more photographs and learn about this work. 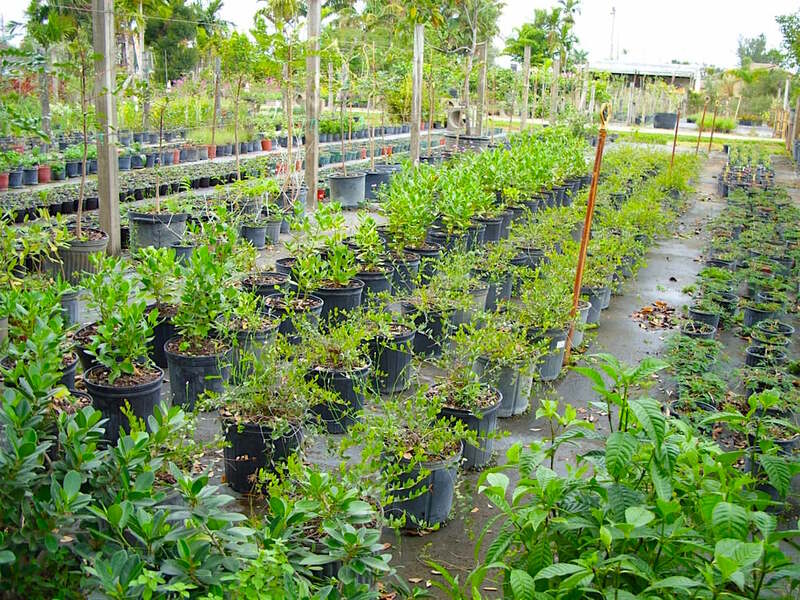 Alyssa Lavoro will speak to “Cultivating native plants for landscaping, challenges for native growers and retailers, and the Florida Association of Native Nurseries". She manages Alexander Landscaping and Plant Farm, a long-time local landscaping and nursery business on Flamingo Road that emphasizes native plants. Bryan Tozzie, Alyssa's father, built and still supports the business and also works at nearby Flamingo Gardens. Alyssa has been passionate in her interest in local native species and attends many nature and wildlife activities throughout the county. Alyssa serves on the Board of Directors of the Florida Association of Native Nurseries (FANN). She and FANN have been hard at work developing a new native nurseries foundation and other efforts helping to promote native landscaping more widely in urban and suburban gardens. The agenda for this Legislative Delegation Public Hearing includes the topic, "Environment and Growth Management". It provides a rare opportunity to speak directly with state lawmakers who represent us in Tallahassee. It is important to tell our representatives what is at stake in Broward regarding the future of our natural areas, what we expect from the passage of Amendment 1 (protect clean water and natural lands), and our urgency for sustainable county and cities choices regarding energy, biodegradable materials, green construction and landscaping. You may have other environmental issues to express. Members of the public who want to speak (for 3 minutes or less) should submit a completed online Speaker Form by Monday, January 16, although forms can also be completed and submitted at the meeting. This is the year, the time, the place to speak. Please. 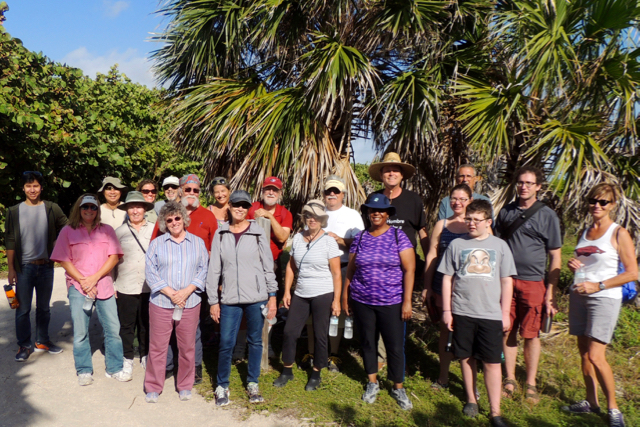 Note: This trip is why exploring with the Florida Native Plant Society is fun. This area has been closed to the public since 2013, yet Park Rangers are letting us in. Come and discover (or rediscover) Chekika with us. 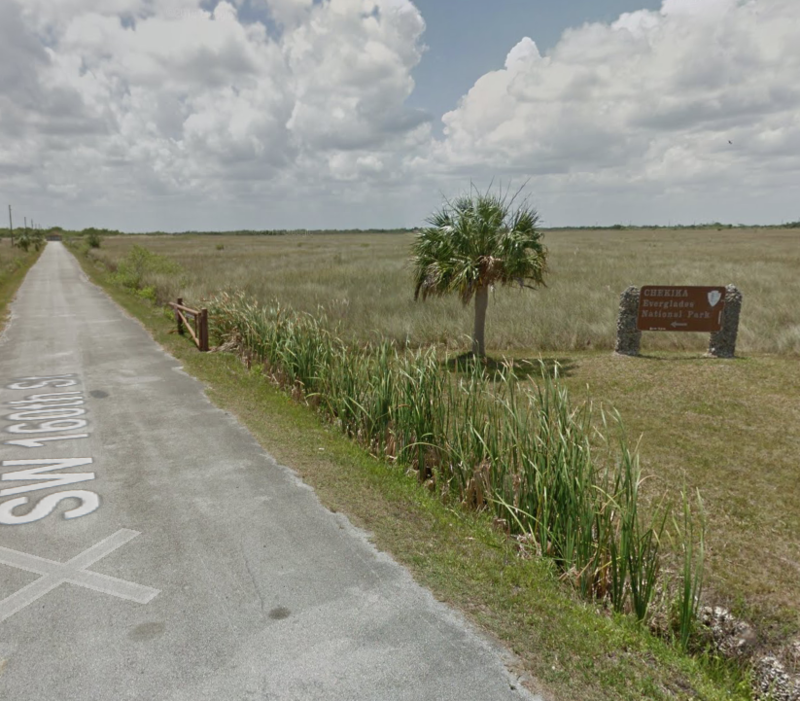 Meet at "Chekika, Everglades National Park" entrance, SW 237 Ave. at SW 160 St., Miami, FL 33187. The gate will be open for ½ hour for us to drive in. No entrance fee. Take Krome Avenue (SW 177 Ave.) to SW 168 Street; turn west, go 6 miles to the end; turn right on SW 237 Avenue; the entrance is on the left at 160 Street. From Ft. Lauderdale the drive is about 1½ hours. 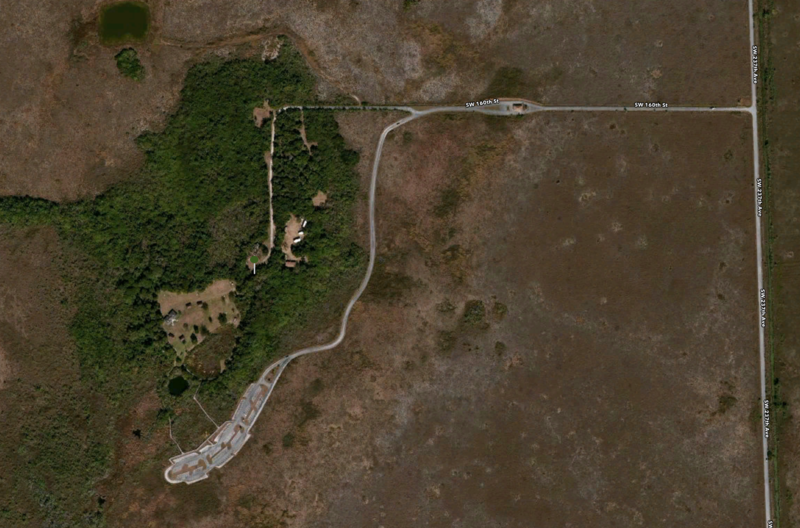 Both Google and Apple maps accurately locate it using the intersection address above. Patty Phares of the Dade Chapter says, "This area was a private resort, then a state recreational area with a scenic swimming hole (fed by an artesian well gushing sulphur-laden water), and other amenities. In 1985, the artesian well was capped due to concern that the brackish water might contaminate surface wells downstream. The park was transferred to Everglades National Parks (ENP) in 1991 and closed seasonally due to high water. In recent years the facilities have been closed due to lack of resources, and nature has been reclaiming the area. However, Chekika is still open to walk-in visitors. Shawn Bawden, Volunteers-In-Parks Program Manager at ENP, will accompany us and explain what’s happening at the site. We’ll be looking at plants but it’s also a great place for birds and butterflies." Difficulty: Easy/moderate - walking in open areas, on boardwalks, roads, unpaved paths; possible optional walking into open prairie that might be a bit muddy or wet. Bring: Sun protection, bug spray (just in case), drinks. Long pants and shoes that can get muddy are advised. Many bring something to lunch on after the walk. Lost or late: Try Richard's cell (954-661-6289). New Year's walkers at Mizell-Johnson State Park (formerly John U. Lloyd) First Day Hike. Our enthusiastic and knowledgeable Rangers were Chris Leon and Laurie Sheldon. Thank you! 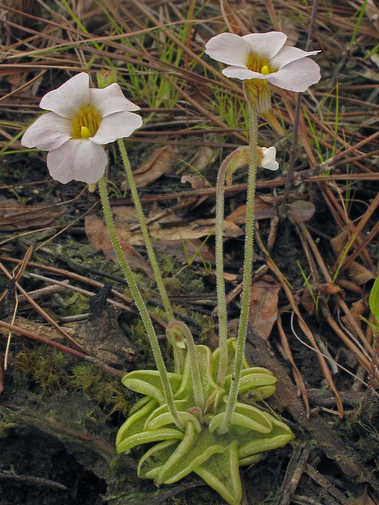 We thank John Brittnacher of the International Carnivorous Plant Society, carnivorousplants.org, for much of the information gleaned for this article. The site has a wealth of science, cultivation information, and beauty. Check any facts you doubt, as we have no such expertise ourselves. As always, thank you to the people at the Institute for Regional Conservation for their expertise regarding Florida native species. 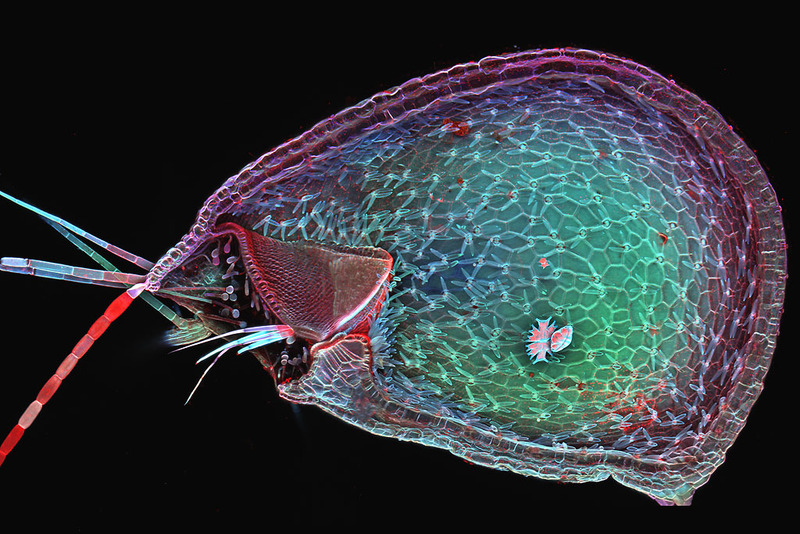 We thank Philippe Marmottant and his team for the entertaining and educational YouTube video of how the bladderwort takes tiny prey. A few of earth's plants evolved to became carnivores, a clever solution to the problem of nutrient poor soils. Trapping insects for food is just one of many examples of the amazing diversity of plants. 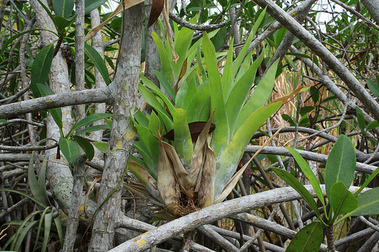 Plants use countless adaptations to thrive in almost every niche on the planet. Learning what plants are, what they do, and how they interact with other plants, animals, habitats, and climate is endlessly fascinating. You have heard us say before, the processes of nature are precisely what we need most to understand to build sustainable communities. Nature's solutions don't harm nature, at least in the big picture, so they have great potential to show us how to use energy, build structures, clean air and water, and live within nature without destroying it. Regardless of their value, each plant is a wonderfully complex and clever solution to thriving in the place where it lives. 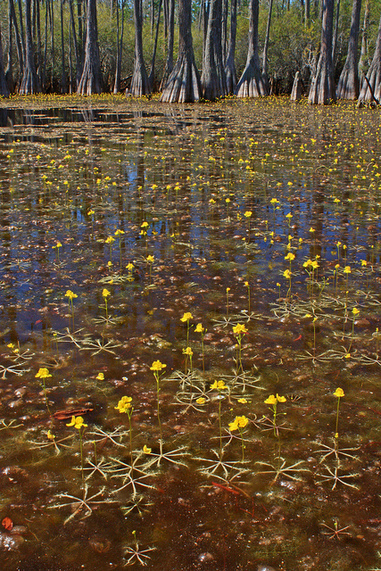 Carnivorous plants hold a special fascination, so let's look at the few that grow around us. 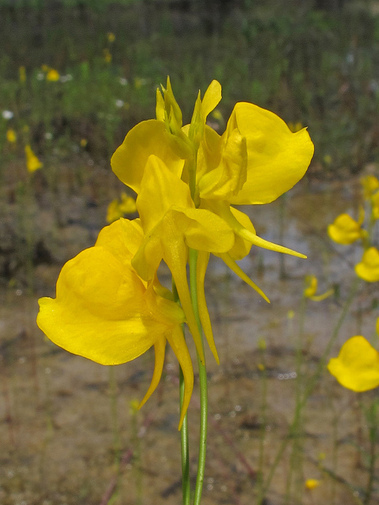 Perhaps none are as spectacular as the pitcher plants, Sarracenia, but they grow further north. Hanging monkey cups, Nepenthes, are seen in cultivation, but come from the tropical Old World. Venus fly trap, Dionaea, is native to restricted areas of North and South Carolina. To learn the secrets of our carnivorous south Florida species, you really need to get down on your knees, or underwater, and look closely. A magnifier will help. 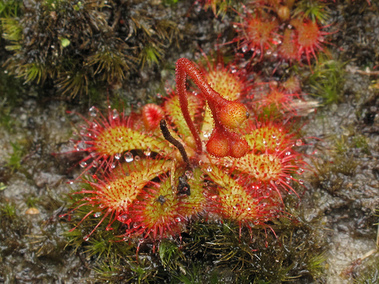 Two species of Drosera, D. brevifolia, Dwarf Sundew, and D. capillaries, Pink Sundew, are south Florida carnivorous natives. 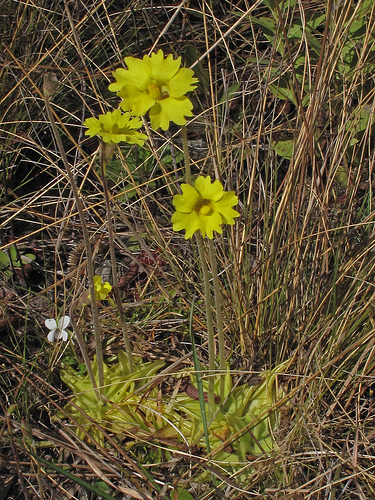 Three local Pinguicula have sticky leaves, P. cearulea, Blue Butterwort, P. lutea, Yellow Butterwort, and P. pumila, Small Butterwort. Most Bromeliaceae are not, strictly-speaking, carnivorous. They trap small creatures with pit trap pools, but their design doesn't seem to be specialized for it. To clearly meet the three International Carnivorous Plant Society requirements, the species must: 1) capture and kill prey, 2) have a mechanism to facilitate digestion of the prey, and 3) derive a significant benefit from nutrients assimilated from the prey. One south Florida Bromeliad, Catopsis berteroniana, Powdery Strap Airplant, may almost measure up. Catopsis berteroniana, Powdery Strap Airplant, is a Florida Endangered and IRC Imperiled epiphytic native of Dade and mainland Monroe counties. C. berteroniana apparently captures more insects than most other bromeliads. 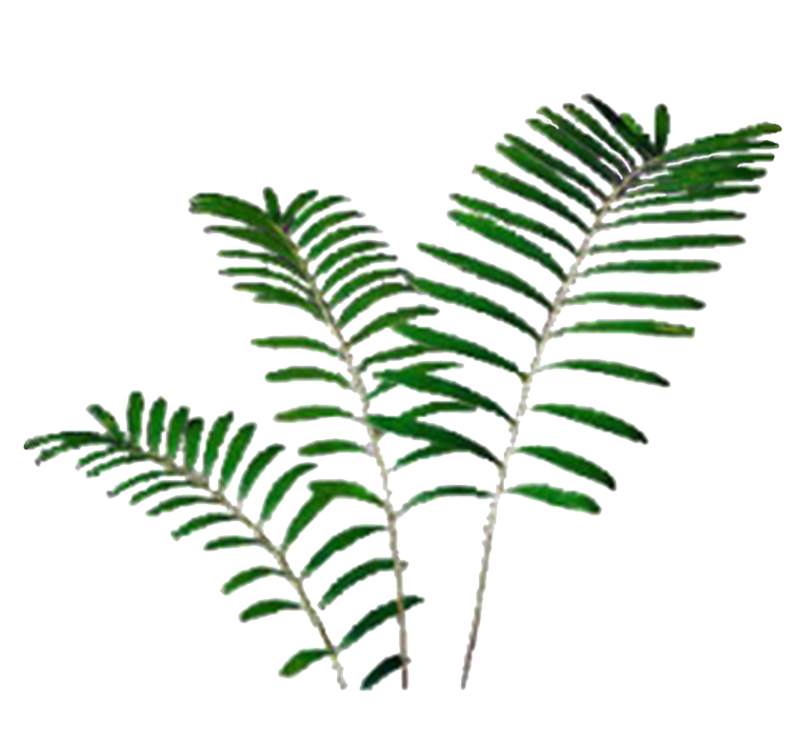 Its waxy, powdery leaves may be the mechanism assisting the deadly slide to the water pool at the base of each leaf. Its yellow green leaves and upright handsome shape catch light so that it appears to some as a lampera de la selva or jungle lantern. How it attracts insects by light or other means is not yet well understood. 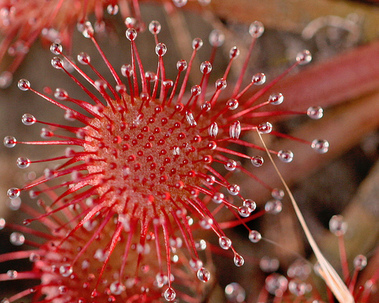 The Drosera have dewy mobile tentacles and the leaf itself may curl a bit to capture prey. The congregated tentacles smother its prey in adhesive slime and digestive juices. The sticky calyx of Plumbago betrays its genetic relationship to Droseraceae and several other carnivorous families. However, Plumbago is termed a "murderous" (perhaps more fairly, "protective") rather than a carnivorous plant. 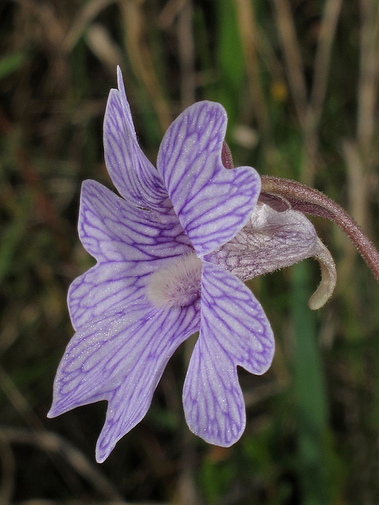 Pinguicula and Utricularia are both in the family Lentibulariaceae although their capture mechanisms are very different. 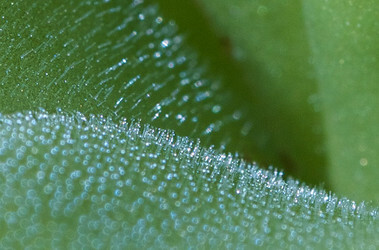 Pinguicula leaves are like fly paper with tiny stalks that hold the glimmering adhesive slightly above the leaf surface (see the photo at the top of this article). 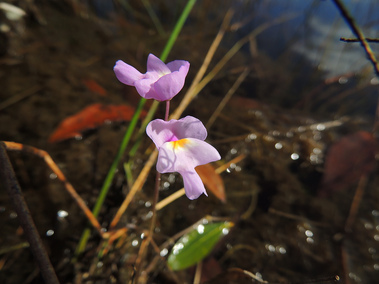 You may never walk by those pretty little Utricularia again without a bit of admiration. 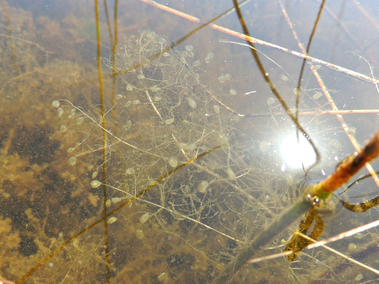 Many secrets are hidden within the wild plants we take for granted and barely notice.